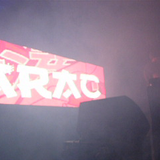 Arac started spinning Drum &apos;n Bass in 2003 under the alias “Nouveau Riche”. He has always been busy promoting and spreading the music he loves to a broader audience. For several years he was the co-host and DJ of “Core Frequency”, a radio show on the Antwerp-based FM station “Radio Centraal”. He was also the promoter of the “Core Fusion” parties in Antwerp, which combined different genres like Drum&apos; n Bass, Dubstep, Jungle and Rave on one line-up.